Portable IR (Infrared) saunas are one of the most versatile inventions for people who like to stay healthy and detox regularly but have no time, money or space in their homes to either go to a public sauna regularly or to install one at their homes. They are flexible, easy to take with you when you are traveling, easy to store and easy to use. The 5 best low EMF portable infrared saunas that I recommend are given below. Click on the links to check the current prices. 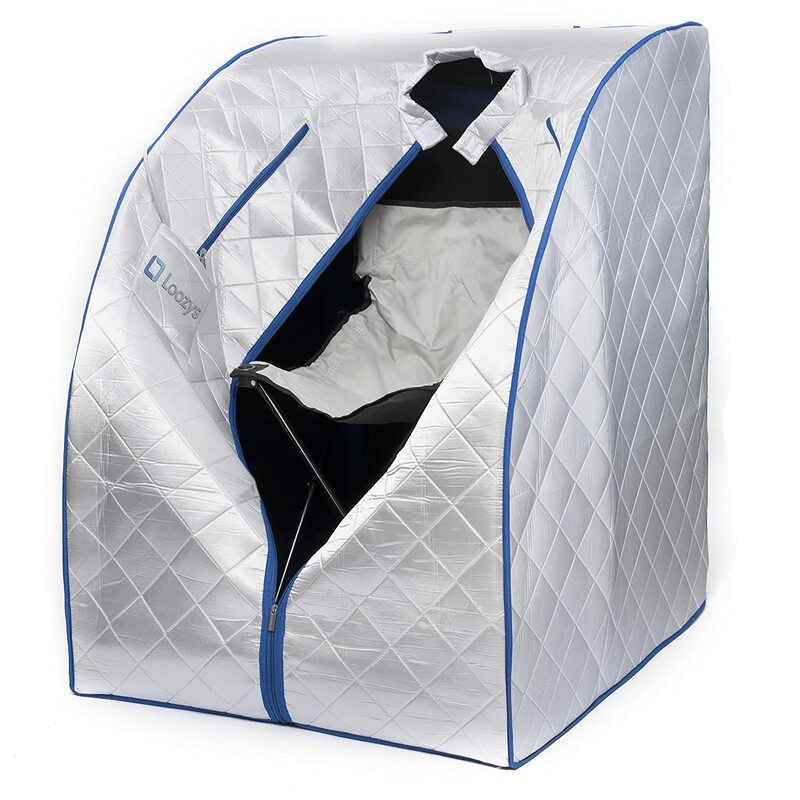 The Durherm Low EMF Negative Ion Portable Sauna with Chair and Heated Footpad is one of the best options available. It has many incredible features and tops my list. The IR lights inside a portable sauna generate an EMF, and if you don’t make sure that your portable sauna is EMF safe, you could be exposing yourself to more levels of radiation than you should. Luckily, the Durherm Low EMF Negative Ion Portable Sauna is one of the safest portable saunas in the market. It is almost EMF-free, and it generates between 200 and 600 times less radiation than any other IR sauna available today. I can’t stress enough how important this is to give you the confidence to jump into your portable sauna anytime you want. You will not have to worry about being exposed to dangerous levels of radiation. This is the key feature that you need to really appreciate. Comfort: This is an amazingly comfortable, portable sauna. So, you can enjoy the benefits of detoxing while reading a book or enjoying a movie, and you won’t even notice how long you have been using it. Portable: The high-quality materials that this portable IR sauna is made of, make it incredibly easy to fold and store when you are not using it or to pack away when you are going on a trip. It is also easy to assemble and disassemble in just minutes. Incredible design: Its amazing design will let you keep your entire body inside while your head and hands stick out to allow you to use your cell phone, read a book, or enjoy a movie. These are things that you certainly can’t do inside a traditional sauna. It also comes in a beautiful orange color that gives it style and personality. It measures 31.5 x 41 inches. Included chair: A common problem with portable saunas is that they don’t include the chair, and it is hard to find a chair which fits inside but at the same time, doesn’t damage the floor. This problem is solved in this portable sauna because it includes a dedicated folding chair that fits perfectly to keep you comfortable while you use it. Included heated footpad: There is nothing more comfortable than resting your feet on top of a heated footpad while your whole body is inside the portable sauna. This model includes a heated footpad that is controlled by a remote. Storage pocket: While this might sound a little bit silly, a pocket for the remote controller is incredibly useful in any portable sauna, because you don’t want to spend a couple hours holding the remote or your cell phone in your hands. But leaving them on the floor could make it difficult to reach and placing your sauna next to a small table to rest the remote or cell phone can make the experience less comfortable. 3 heaters with Tourmaline panels: Tourmaline is a semi-precious mineral that emits infrared waves and negative ions, and it is well-known for its properties that aid in the process of detoxification. The Durherm portable sauna includes three heaters for maximum results and includes Tourmaline panels. Two washable neck collars: This portable sauna also includes two soft terry-cloth washable neck collars that zip on and off to prevent the sweat from falling on the outside of the portable sauna. They are easy to put on and take off, and even easier to clean, and are a great addition to your portable sauna experience. The low EMF performance and valuable features make the Durherm, my top recommended low EMF portable infrared sauna. The Radiant Saunas BSA6315 is an amazing and elegant model of portable IR (infrared) sauna that includes many features and benefits. Here are some things you need to know about it. The great thing about the Radiant Saunas BSA6315 is that its infrared heater panels emit a very low electromagnetic field. So, you can safely spend as much time as you want inside your portable sauna without worrying about any possible health complications related to high levels of radiation. While this model has several incredible features that we are about to review separately, the low EMF is probably one of the first things you should look for, and one of the best things about this amazing portable IR sauna. Hand-held controller: This model features a hand-held controller, that lets you choose between six automatic timer options and four levels of preset heating options, so you don’t have to interrupt your session by looking at the bottom of the portable sauna if you want to adjust a setting. Sewn-in pockets: Right in front of the cabin of this IR portable sauna, there are two convenient and elegant sewn-in pockets. One is a perfect fit for the hand-held controller, so you can always keep it at a practical distance, and the other can fit your phone, your TV remote or any other small item you want near you while you detox. Chair included: As you might imagine, you need a comfortable and appropriate chair to sit on while you enjoy your portable IR sauna. While some models don’t include the chair, the Harmony Deluxe does come with one. It is not only comfortable and durable, but it is also designed to avoid damage to the floor of the cabin. Two removable collars: While some models only include an attached neck collar, the Harmony Deluxe comes with two zip-out, double-lined neck collars specifically designed to be soft, and comfortable to touch. It looks amazing and can be easily removed to be thrown into the washing machine whenever required. Dual interior/exterior zipper: There is nothing more that ruins your experience while using a portable IR sauna, like having to zip up the cabin from the inside when there is only an external zipper. You either need help from someone else, or you are left with a small hole at the top, and all the steam escapes. With this model, you don’t have to worry since the zipper is dual, and you can easily close the cabin from the inside. Quick-n-easy-setup: The Harmony Deluxe portable IR sauna is designed to have an easy, and quick setup process. You just need to place the portable sauna in the location you desire, open it up, plug it in and turn it on. After your relaxing detox session, you just turn it off, fold it and you will be ready to go. It is incredibly versatile and easy, and each process takes only one minute. Astonishing design: While some portable saunas focus only on the functionality, the Harmony Deluxe combines very powerful and EMF safe carbon panels with one PVC carbon footpad for an enhanced experience. It comes in a chocolate color that is guaranteed to brighten up any room you place it in and makes your experience more luxurious and relaxing. Besides, the materials are very durable and easy to clean. The SereneLife Portable Infrared Home Spa is a stylish, versatile and wonderful option if you want to enjoy all the benefits from a traditional spa at your own home, when you are traveling, or at your best convenience. Here are some things you need to know about it. The SereneLife Portable Infrared Home Spa has very low radiation emission levels, and while it has several other features that you are about to learn, this feature is probably the first thing you should pay attention to when buying a portable sauna. The SereneLife Portable Infrared Home Spa has an amazing design and functions that make it stand out from the crowd. Energy-efficient low EMF carbon fiber heating panels: The heating panels are the main component of any portable sauna. They heat your body directly to avoid unnecessary humidity levels present in traditional saunas to make you sweat, and help you get rid of toxins inside your body. The powerful carbon fiber heating panels in the SereneLife home spa can heat the cabin up to 140 degrees Fahrenheit to achieve maximum results. Customizable heat levels: There is nothing more obnoxious than a portable sauna that is either so hot that you simply can’t stand it, or so cold that you don’t feel like it is working. Luckily for you, with the SereneLife home spa, you can customize the heat level to your preferences to make the experience personalized, and amazing. Automatic timer: When you are enjoying your portable sauna, time can fly by. To prevent you from staying for longer than you need –especially because portable saunas are usually used by people in a rush, this model comes with an automatic timer that can be programmed for sessions up to 60 minutes. Included chair: Your portable sauna comes with a comfortable chair for you to sit on while your body detoxes. It fits perfectly, can be folded and can be easily carried along with the portable sauna. Built-in pocket and remote: For maximum comfort, the SereneLife home spa includes a remote so that you can control the heat and timer settings. It also has a pocket built in at the front of the cabin so that you can freely use your hands for reading, or checking your phone, without having to worry about losing the remote. Astonishing design: There are two models available, one in black and blue and one in white and blue. So, you can choose the one that better suits you. The SereneLife home spa has a modern look, and it is made from a resistant and durable material that is easy to clean and fold for storing and transporting. Included neck collar: To avoid the sweat that may fall on the outside part of the cabin, the SereneLife Portable Infrared Home Spa includes a soft and absorbent neck collar that fits you comfortably. Weight: To combine versatility with practicality, the SereneLife home spa weighs only 20 lbs. So, you can easily take it with you on a trip or even take it to your clients’ homes if you have a mobile spa service. While there are many models and brands of portable saunas, one of the best around is the Loozys Rejuvenator Portable Infrared Home Sauna Spa. Not only does it look great, but it is easy to assemble and very powerful. The Loozys Rejuvenator emits low levels of radiation, so, you can be safe while enjoying your session, no matter how frequently you use it. Modern and elegant style: This model of IR portable sauna comes in a very sophisticated and futuristic silver/white color with details in blue. It is made of very durable and easy-to-clean materials that not only look amazing but are also versatile and functional. Dual zipper: From the outside, you can see a traditional zipper that closes the cabin after you get out. But, it does have a zipper which is dual, which means, it can also be closed from the inside. So, you don’t need anyone else’s help to enjoy a relaxing and beneficial detox session. Built-in pocket: The cabin also features a very practical pocket to store the remote or your cell phone and make your experience as comfortable as possible. Chair: The portable sauna comes with a chair that perfectly fits in the cabin without damaging it. Remote: The sauna also comes with a very practical remote that allows you to control the customizable heat settings and the timer to program a session of up to sixty minutes. So, you get the perfect settings for your rejuvenating sauna session. Included neck collar: If you don’t want the outside of your cabin to get wet, you are going to need an absorbent neck collar. The cool thing about this portable IR sauna is that it has one built in, so you just zip it up, and it sits comfortably around your neck. Included foot warmer: As if everything else wasn’t enough, this beautiful portable sauna also includes a foot warmer. So, your feet can stay comfortable and cozy while you are sitting down and enjoying all the health benefits that a detox session in a portable IR sauna brings with it! The Idealsauna Infrared Indoor Personal Sauna is one of the most elegant and convenient options available, and it also has a particular feature that is of incredible importance: low EMF emissions. Let’s talk about that first. The great thing about the Idealsauna Infrared Portable Indoor Sauna is that it emits very low levels of EMF radiation. So, you can rest assured that you are not risking your health while enjoying a revitalizing detox session. Now that we have covered the most relevant, and important feature, let’s look at everything else that makes this portable sauna an ideal choice. Heating foot panel: This model includes a heating foot panel controllable by remote so that your feet are comfortable while you detox. Remote controller: If you want to choose the perfect heating settings or set the timer for a defined period of time, you can just use the included controller for maximum comfort and practicality. Negative Ion heating panels: The powerful negative ion infrared heating panels in this portable sauna allow it to heat up in just five minutes and achieve the perfect temperature for your whole body to detox quickly and comfortably. Besides the technological ones, the Idealsauna Infrared Portable Indoor Personal Sauna has some amazing designs and comfort features. Built-in pocket: In this pocket, you can safely store the remote while you read, or store your phone while you adjust the settings with the remote. So, you don’t have to place anything on the floor and then struggle to reach it. Included chair: This portable sauna also comes with a very comfortable chair for you to sit down while your body detoxes. It fits perfectly into the cabin and doesn’t damage the floor. Futuristic look: The cabin is designed in a silver color with blue details that looks futuristic, modern and very stylish. It also includes a dual zipper that allows you to zip the cabin from the inside without requiring anyone else to help you. Large dimensions: For you to comfortably fit into the cabin, this large model measures 27.5 x 30 x 38 inches. Incredibly portable and versatile: This is probably the most important feature of a portable sauna since it is in the name itself. The Idealsauna Infrared FAR IR Negative Ion Portable Indoor Personal Sauna folds easily and quickly to be very versatile. It is very lightweight, which allows you to carry it easily no matter where you go. It assembles and disassembles in just minutes for maximum practicality, and when folded, can be stored under a bed or inside any closet without occupying much space. Foldable Chair: The chair included is also foldable, so you can always take it along with you and your portable personal sauna. All these features make it an amazing choice for people who own a mobile spa business since it can be easily transported and installed in any customer’s house in just a matter of minutes. If you want to take your sauna wherever you go, you should consider buying a portable IR sauna. While most of the brands available share a somewhat similar design, as it happens with pretty much any other product, they come in a wide range of prices. The same way that a traditional sauna can become hotter by adding more stones to the water, a portable sauna should come with as many heat settings as possible. This is achieved by increasing the intensity of the IR light so that the portable sauna becomes hotter. This is a feature that you need to look for in your sauna since those that only come with one setting are not very versatile or useful. Naturally, you are going to spend many hours inside your portable sauna, and you want it to be comfortable. Some designs might cause an ache in your neck or are just badly designed. This is one of the easiest ways to ruin your detox session, so you should only buy one after trying it to see if it is comfortable. You need a chair to sit on while you are using your portable sauna. You should look for saunas that come with a chair included, as the ones that don’t, can be easily damaged by using the wrong chair. EMF stands for Electromagnetic Field, and it is the level of radiation that all appliances generate. Especially in IR saunas, you should look for one that emits low EMF radiation to be assured that you won’t experience any health issues later. IR saunas have several benefits that are similar to those that you get in a traditional sauna. Traditional saunas make you sweat by increasing the temperature of the entire room, which, naturally, requires more heat. IR saunas help you achieve the same sweat levels and health benefits at lower temperatures since they heat your body directly, instead of the entire room. Also, it takes a long time for a traditional sauna to cool down a bit if you feel like it is too hot, while IR saunas’ temperature can be regulated quickly and easily. Contrasting with the high levels of humidity present in traditional saunas, the IR light that heats a portable sauna does not require steam. So you can get the same results without being exposed to the effects of humidity. One of the obvious benefits of a portable IR sauna is the versatility. Since they can be taken anywhere, you do not have to reserve a traditional sauna, they can be used for as long as you want to and whenever you want to. Going to public saunas can be pricey after several sessions and installing a traditional sauna in your home is way more expensive than that. If you are looking for the same benefits for less money, a portable sauna is an investment you will get back very soon. So, you can stop wasting money on public saunas. Why Go for a Low EMF Sauna? As we mentioned before, all electronic appliances generate an electromagnetic field that can be very harmful to your health in the long term. In a portable sauna, you will be very close to the source of radiation and hence, severely exposed. So, you should look for a model and brand that emits low EMF. This way, you will be able to safely enjoy your portable sauna as much as you want without risking your health. If you liked this article, please share it. Thanks for reading!